We all know how it is - wait ages for a device that can run forever on a single battery and then two come along at the same time. 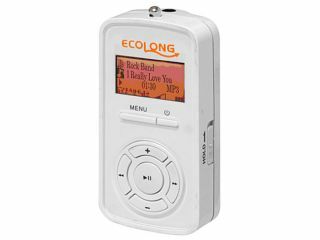 So, let's stick to the basics - NHC's 34g Ecolong DAP plays MP3 and WMA audio files, comes in a choice of white or camouflage designs, makes a single AAA battery last 85 hours and is as ugly as sin. NHC has a website filled with all sorts of subjective claims about how the Ecolong will stretch six batteries out over a year. Or how one cell sees the average daily commuter through two months of strap hanging, whether listening to tracks from the internal 1GB of flash memory or its FM radio. The white version costs ¥4,980 (£21), while the camouflage model costs ¥5,980 (£26) and comes with a super-tacky matching case. Both models are otherwise identical, with a four-line monochrome LCD and measuring 78 x 36.6 x 18.5mm. As a USB mass storage device, the Ecolong is flexible enough to consider but the styling leaves a little too much to be desired, even if its impressive battery consumption is relatively kind on the environment.